Every time I think I’ve found a way to make my little girl happy, it seems that something else comes up that makes her even more excited! She has been a fan of Liv dolls (made by Spinmaster Toys) for a long time – her Sophie doll has always been one of her favourites and she has told me countless times that she wished that she had some of Sophie’s “friends” so they could play together! When I asked her which Liv doll she’d like to have, she quickly told me that she’d really like Daniela – little did she know that her wish would soon become a reality! The squeals of delight that I received when she saw her new “It’s My Nature” Daniela doll were unlike any I’ve ever seen before – she was beyond excited! 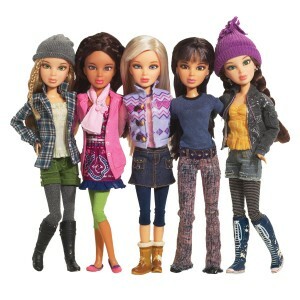 The “It’s My Nature” Daniela doll is really cute – I wish my dolls had been that hip and funky when I was a little girl! Daniela is only one five dolls in the “It’s My Nature” collection and each doll reflects her own cool look. I thought Daniela was really cute because I loved her slightly bohemian look – she has a red bandana, some really cool jeans (do they make these in regular women’s sizes as I’d like a pair) and a number of accessories, including a guitar and an interchangable wig! With the inclusion of some other fashion accesories, my girl is able to take Daniela, who is casually dressed, and really give her a glamorous look! These outfits are really pretty and I love the fact that Daniela, like most people in real life, can either be dressed casually or can have a sophisticated look! 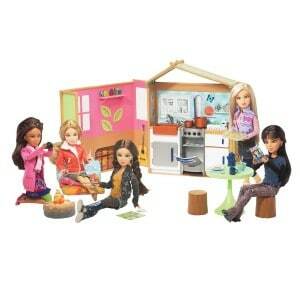 A great thing about these outfits are that they are easy to put on, or take off, the Liv dolls. I think this is important because small children don’t often possess great fine motor skills so, if the outfits are made to be put on or taken off easily, it can be really frustrating! I’m happy to say that Daniela can be dressed or undressed easily as outfits are easy to take on or remove. As excited as she was by the “It’s My Nature” Daniela, my little gal was even more thrilled when she saw the Maple Lodge Playset! This set had everything – I must admit I was in awe myself! I loved the fact that it has a campire that will light up, a hammock, a kitchen and a tonne of cute pieces that make the set seem more realistic! Sophie and Daniela (along with my girls) have been spending a lot of time in the Maple Lodge and playing out many different camping scenarios! This set is absolutely adorable and a playset that really enhances creative play and storytelling! Overall, I’m really impressed with the quality of the Liv doll we received and all of the accessories. They are well-constructed, durable and also each piece shows an attention to details that I’ve never in other doll products. With the holidays, I expect to get requests that more Liv dolls be delivered by Santa and I think that will be the case as I think the dolls and their accessories are simply amazing! If you are interested in learning more about the Liv dolls and all their amazing accessories and play sets, check out their Product Site. With the upcoming holidays, I think these new Liv dolls and accessories would make many girls very happy if they found them under the tree!